Ayurveda Clinic - Jade Wellness Studio - Yoga, Pilates and Wellness in Sault Ste. Marie, Ontario. The term Ayurveda is made up of two words: Ayu - which means life, and Veda - which means knowledge or science. Hence, Ayurveda is the Science of Life and Longevity, which originated in India many centuries ago. All Ayurvedic concepts and principles are based on one common belief , that human beings can live a healthy and happy life as long as their mind, body and soul is in perfect equilibrium with the forces of nature, including Earth, Water, Fire, Air and Space. Further, it is believed that every individual is unique and is born with a balanced body which is made up of a combination of three types of energies or doshas, namely Vata (air and space), Pitta (fire and water) and Kapha (water and earth). These three constitutional doshas are present in varying amounts in each of us and it is believed they determine our nature, disposition, behaviour patterns and physical attributes. If at any point in time the gentle balance between these three doshas is disturbed, the body's functioning can be disrupted. 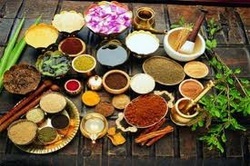 The use of Ayurvedic herbal techniques can then be used to restore the lost balance of the body. Detoxification is the first step in the process of bring balance back to the body. Treatment then can continue with various herbal medicines, massages and home remedies. Chandralekha Anandavally is a licensed Ayurvedic doctor. She received her Bachelor of Science from Karnatak University, Dharwad India in chemistry, botany and zoology. After university she graduated from Rajiv Gandhi University of Health Sciences, Bangalore India with a Bachelor of Ayurvedic Medicine and Surgery. After graduation she received a fellowship from the renowned Vaidya Chandra Prakash Cancer Research Foundation, and worked there as a research associate. Dr. Chandra's main objective has been to make a difference in Holistic Health Care by using her education and professional wisdom. Includes a complete constitutional assessment, incorporating the client's health history, daily and seasonal diet, and exercise routines. Any current physical or spiritual concerns are also addressed. The client will receive lifestyle management recommendations which may include Ayurvedic herbs and formulations, nutrition advice and other various treatments.